The daily closing TIKI is the blue line at the top, and I have added Bollinger Bands. The candlesticks at the bottom are the daily SPX. 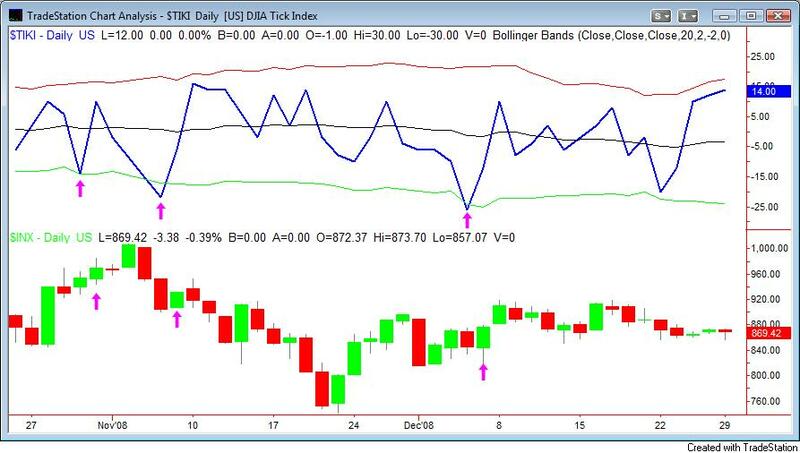 I have put a purple arrow at each point where the TIKI hit the bottom Bollinger Band. I have also put purple arrows at the next day’s SPX candle. Buying the open and holding until the close the day after the TIKI hit the lower Bollinger Band would have given you three winning trades over the two months shown on the chart. This happens because TIKI extremes usually reflect overbought/oversold conditions. For an extensive discussion of the TICK, see my book: The General Theory of Day-Trading.